Businesses in the Ottawa region expressed confidence in the local economy, according to the Ottawa Business Growth Survey from the Ottawa Chamber of Commerce, Welch LLP and Abacus Data. 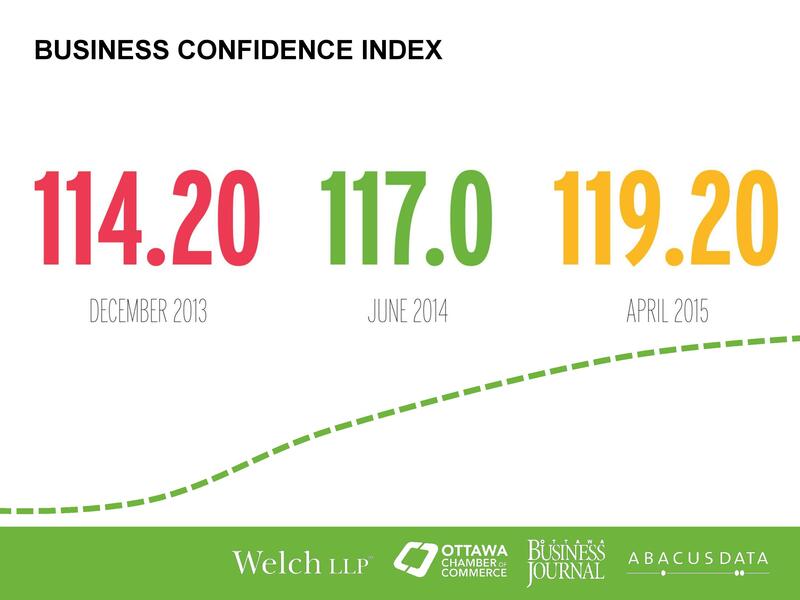 Lead by the technology, banking and hospitality/tourism sectors the Ottawa Business Confidence Index score slightly increased to 119.20 from 117.0 last year, a clear indication that Ottawa’s economy remains optimistic and strong. Despite the positive economic outlook, the study also showed that 52 per cent of businesses find barriers to doing business in Ottawa. Access to a skilled workforce, access to capital and business taxes were seen as the top three barriers to doing business. Of those who responded a skills shortage as the biggest barrier to doing business, 44 per cent responded that finding employees with technical skills is serious problem, whilst 45 per cent indicate that finding employees with previous experience in their respective sector is a moderate problem. 60 per cent of respondents also claimed they provide enough or more than enough workplace training for their employees, contrary to recent industry reports that chart steady declines in workplace training. Interestingly, 44 per cent of Ottawa business owners plan to exit their business within the next 10 years, of which 48 per cent indicating they are likely to sell their business to an external third party as an exit strategy. Whilst 47 per cent of respondents believe that the technology sector offers Ottawa the greatest potential for growth, 41 per cent believe that improvements towards training and mentorship around entrepreneurship will activate local economic development. The Ottawa Business Growth Survey is the most in-depth and independent study of the local economy with more than 450 business leaders responding to the survey, providing a comprehensive business overview of the National Capital Region.